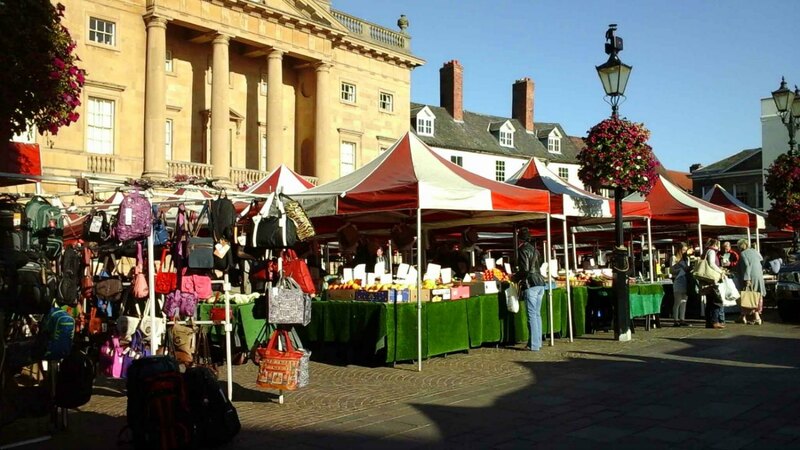 To visit the historic town of Newark-on-Trent and not experience the delights of its Market Square would, indeed, be a pity. It is the focal point of shopping in the town, the hubbub of life. Young and old from surrounding villages mingle with townsfolk in search of bargains on the many colourful stalls. Others choose merely to browse, absorbed in the sense of history around them. The Square is encompassed by four high walls of buildings, interrupted by medieval alleyways and narrow streets, designated traffic free on market days. Glimpses of architectural styles, dating from the Middle Ages to the present day, urge the sensitive mind to create visions of dashing Cavaliers and solemn-faced Roundheads, of stagecoaches at the coaching inns, or Victorian ladies in their crinolines. The imposing spire of the thirteenth-century church dominates the view on the northern side of the Square. Its clock, with golden hands and face, strikes each hour, a reminder of ever-passing time and twentieth century reality. The hot August air hangs still and humid; spicy aromas of hot-dogs and fried onions drift from the kiosk on the edge of the Square. Hungry teenagers queue to savour these delights. Crowds of shoppers are jostled along between the stalls with canopies of bright red, white. and yellow. A harassed young mother struggles over the cobbles with her pushchair, laden with plastic carrier bags bulging with shopping. The red-faced infant cries incessantly. Numerous clothing stalls display a variety of items; the latest ‘Turtle’ motif on socks and sweatshirts attracts many young shoppers. Posters proclaiming ‘Summer Clearance’ and ‘Everything Must Go!’ indicate that summer is nearing its end. Surf Crazy t-shirts won’t sell in the long, cold days of winter. Seasonal fruits and vegetables are in abundance. Crisp apples and mellow pears, golden plums and purple damsons are arrayed with a selection of vegetables labelled ‘All Local Produce’. More exotic spiky pineapples, pump water melons and juicy oranges and grapes complete the display. ‘Get yer onions for yer barbies’, yells a burly, sun-tanned man with golden chains hanging down his hairy chest. The flower stalls, too, present an arrangement of summer blooms, the heady scent of pink carnations catching the attention of many a customer. Feathery white gups are interspersed with freesias of blue, chrysanthemums, russet or gold, and lilies of flaming orange or sombre white. As the church clock strikes four, stallholders begin to pack away. Into the cases co the multi-coloured beach towels and tablecloths of Nottingham lace. The ornate, brown teapot disappears from view, a vacuum cleaner called Henry is returned to his box and customers take their ‘homemade’ pies home for tea. I can honestly say I’ve NEVER indented first lines since – and I always notice when other people do. Nor have I ever underlined titles. It’s funny because in schools, all titles in exercise books or on file paper were ALWAYS underlined. It was also taught that first paragraphs, as any other paragraphs, were indented. One thing Mrs. Tutor didn’t mention was my appalling ellipsis after the title. I’m surprised she didn’t write ‘NEVER use more than three dots in an ellipsis’ – but she didn’t remark. Perhaps she’d have dealt with that on another occasion, so not to demoralise me further. The scene I described in my assignment was of late August, 1988. I’m sure you wouldn’t have missed the reference to very ’80s clothing (Turtle motifs). 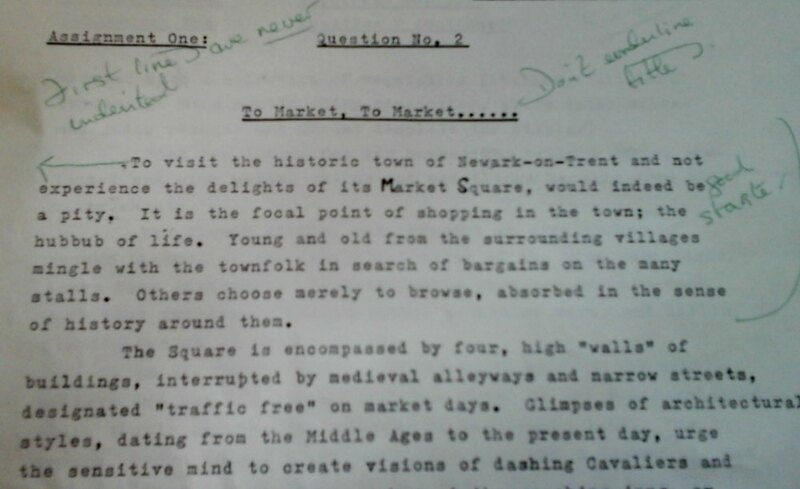 Today, Newark Market Square looks little different to how I described it in 1988, except that the market is nowhere near as popular or busy as it was years ago. Supermarkets and hypermarkets have made it easy for working people to do all their shopping in one go. From several busy days a week, Newark is now only busy on a Saturday. It’s sad to see, and we keep up our weekly visits there, simply because we love the whole feel of market shopping – and the produce is always fresh. Another big difference is that the bumpy, uneven cobbles are gone. They were seen as a hazard to old folk, wheelchair users, mothers with pushchairs and so on. They were really old and it’s a shame to see things of historical value destroyed but, I suppose, safety was uppermost on the Council’s mind. In the photos below (from late last September) some of the old cobbles can be seen around the edges of the market and in roads leading off the Square. The walls of historic buildings encompassing the Square look just the same. The last difference is in the actual stalls. Back in 1988 the stalls stayed up all the time, so traders only had to unload their produce. Now, on non-market days, the Square is empty.The canopies, too, were formerly a variety of colours and patterns. Now, for some reason, they’re all red and white striped. I wrote a post about Newark Market Place last October (here ) and our son who has his butcher’s shop there. I put lots of photos in it of the Market Square and surrounding streets. I love your piece and all of the imagery. It is so cool that you have a description of how you saw the market in 1988, and can compare it to today. It is sad that it isn’t like it was. Great post Millie! Thank you for the lovely comment, Antonia. (I somehow missed this earlier … sorry!) Yes, I suppose the piece I wrote back then is my own little bit of historical ‘evidence’. Ha ha. Wonderful post, writing, and images, Millie! Thank you for that lovely comment, Ann. It was 28 years ago I wrote that piece – which makes me feel really old (which, of course, I am 😦 ). I like how the council kept remnants of the old cobbles and the new ones look well planned. It would be a nostalgic moment coming across your old words, Millie. I’m sure, when we wrote short stories in school, that we indented the first paragraph, too. I can imagine what it was like to type out a novel manuscript in the olden days! Yes, I suppose there are both styles now, and the old ones were quite dangerous. It’s just that Newark had the oldest cobbled market place in Britain until then. Some people reckon it was the oldest in Europe. It was quite sad to see the cobbles being ripped up- but safety must come first. It’s funny about the first line indents, because lots of writers still do that. But I don’t think I’ve come across any traditionally published books that way – not in recent years, anyway. I’d never indent first paragraphs now! That tutor did me a favour in that. Thanks, Christine. The oldest cobbled market in Britain, gosh. That is a shame but they must have really been dangerous. It’s funny how that rule hits many of us by surprise. Books I come across on Amazon now with first line indents really don’t look right. But perhaps the rule isn’t as set in stone as I’d thought. Apparently (I Googled), it can be a regional thing depending on the book of style followed. That’s interesting! I’ll have to look it up myself. Thanks for that, Christine. You make me wish I had kept some of my old creative writing and what my teachers said back in college. Although perhaps I would not be so brave as you, to look at it again! What a lovely market you describe — and show in your photos. I always love going to market squares. It makes me feel a bit like I’m reliving the old markets of yore, where people made a special trip into town only a few times a year to sell their goods, catch up on gossip, and maybe catch the eye of that potential special someone they spotted at the last market. That piece of writing made me cringe when I found it. The typing is so awful! I have to say, the first two comments the tutor made, came in useful once I did start writing my novels. I know you like to read any =thing connected to medieval life, as that ties in well with your setting for Eneana. Markets and fayres go back hundreds of years, and in England, at least, they were linked together, as you said. They were big events for a town, often on special occasions, like saints’ days. All sorts of ‘shows’ were put on too – like bear baiting, acrobatic displays and a variety of competitions. The coming of the fayre and associated market was a time of celebration for the community, when everyone got together and had fun – and lots to eat and drink! I remember reading one of your stories with a similar setting. Yes, I love imagining myself at a traditional medieval fayre like that — so much so that it’s difficult for me to write about them in Eneana without it sounded too similar to real-life markets; I try to put a little something fictional in there, just to keep it new. I know what you mean,and I don’t think you’d have any problem at all in coming up with something fictional, or surprising. That is how history is done or, better to say, written! Amazing! Thank you, Ann! A really lovely comment. It’s always fun suddenly finding old “schoolwork” after so long! We were always taught at school that the first line of a paragraph should be indented too. I wonder why? I’ve never seen it in a novel. I don’t know, either, but it’s what the kids are still being taught now – at least it was, until I left teaching a few years ago. 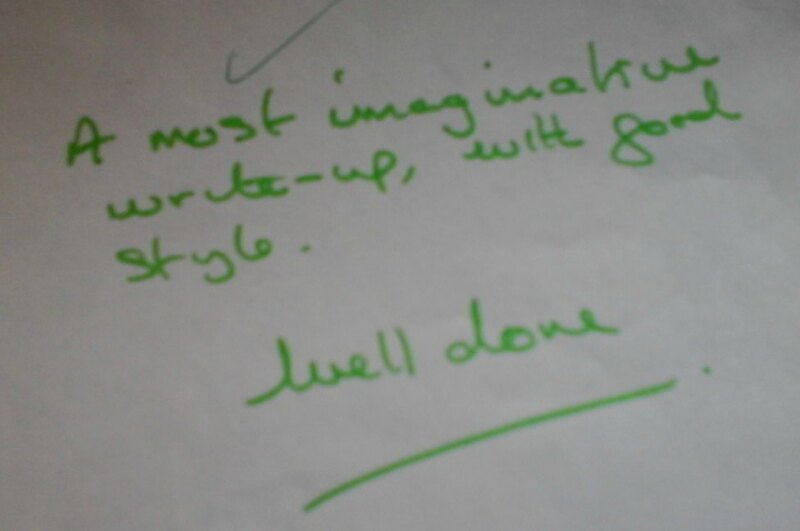 As soon as I saw that tutor’s comment, I realised she was right. Novels and printed stories are never indented. Why should handwritten things be different? Ah well … Thanks, Ali. I love history and this gave me such a wonderful look into a place before time changed it. Thank you. I would have kept the cobbled streets too but I understand the hazard it poses. Love your style. Thank you! Yes, It’s true to say, I’m a bit of a history fanatic. Most of my posts are about places we visit, with occasional pieces of flash fiction or writing in general. Newark is a quaint old town and, like everywhere else, has seen lots of changes over the years. It was a treat to read from someone who lives in that area. I am always intrigued by small village life. I grew up with Enid Blyton filling my head with adventures and places I could escape to, never knowing until later on in life they actually existed the other side of the world. I will be back to read more, in the next month once my best friend returns to Canada, as I am with her most days on her visit back to Malaysia. I think we all do that as children, when we read about places so different to our own. The imagination of a child can conjure up so many colourful images. We have a lot of old buildings in our village, The church dates back to the 11th century – like so many English churches do. Enjoy the rest of your friend’s stay. It must be wonderful for you both to spend time together. i recently finished a book on 12th century France and there was lots of references to England. I love descriptive works that help me understand how history shapes our present. as a child i had a wild imagination that got me into trouble most times! Wild imaginations often get children into trouble. Louise has a really wild one, I can tell you. 🙂 She’s been a bookworm and photographer since she was young, and she’ll never change. With that being said, I loved reading your piece and learning about the local market and how it has changed and still does…. as time goes by. Millie, I think that your market description is great. You start like a painter, drawing a sketch. Then you fill it up with colours, and finally, you use a smaller brush and paint in the details. Voila. Thank you, Inese. You know, so many self-published authors still indent first paragraphs, You never see them in traditionally published books, do you? I thought the post might hit home with a few readers. I never forgot the message, even though I didn’t continue with the course (after paying a lot of money for it, too!). It wasn’t only going back to school that stopped me, you see. A couple of months later, Nick was in a car accident and was in hospital for three months. And – you may have guessed – had to retire from teaching (at the age of 42). Needless to say, I had to carry on. I suppose we all have out tales of woe. Anyway, I was sorry not to carry on with the course. The tutor, whose name was Margot, sounded really nice and helpful, and I felt a heel just dropping out. But needs must. I’ll be coming over to read your post tomorrow, Inese. It’s a bit late now, and my eyeballs are about to drop out! Oh these school programs! Sometimes they are so detached from the real life. Thanks for the lovely compliment, Prabhat. I used that old typewriter for years, By the time I wrote that assignment, some of the letters didn’t work properly, so i had to go over them with a pen! How awful is that! That definitely takes me back to some of the old rules I still follow! I’m sure a lot of us still do, Jason. Old habits die hard, as they say. Btw – will be contacting you soon about my flash fiction book. 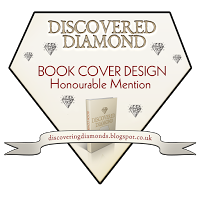 It’s being formatted now, so should soon be ready for publication. Very descriptive and fun. Come visit my blog today!